A basic one-bar MIDI Clip playing the Impulse Drum Machine. How do you play a loop in Live? You drag it into a track, click the Clip's play button, and off it goes until you hit stop or play another Clip in the same track, right? This is the most common method of triggering Clips in the Session view, but it's certainly not the only way. In this month's Live article we'll explore the hugely powerful Follow Actions that allow you to create groups of Clips that trigger each other in various different ways. We can then, for example, add this to the drum-pattern programming techniques from the last Live column to create repeating arrangement structures built from multiple MIDI Clips. First, though, we need to look at the basic Clip launch modes. The 'Play Next' action allows you to chain multiple Clips together. At the end of the sequence, play will return to the top Clip, looping the whole group. Every Clip in the Live Session View has its own launch settings, which appear in the Clip view at the bottom of the screen when you select the Clip. If the launch settings are not shown, click the 'L' button at the bottom left of the screen to display the Launch Settings box. The default launch mode for all new Clips is set in the Preferences; the factory default is Trigger. When a Clip in Trigger mode is launched (either by clicking its launch button, or hitting a MIDI or computer key that is assigned to it) it will start playing back and continue to play until you press the main Stop button or the Stop button on the track, or until you launch another Clip on the same track. (You can also launch the same clip again and it will restart from the beginning.) The exact time the Clip will start and stop is determined by the Clip's Quantisation setting, which is also defined in the Launch Settings box. This is Global by default, meaning that the Clip's quantisation will follow the setting in the top transport bar of Live 's windows. The Global quantisation is usually one bar, so all Clips will play back with their downbeat in sync. However, as we'll see, it is sometimes useful to change a Clip's quantisation to a different time value. The other three launch modes are best used with MIDI triggers or keyboard assignments (see box below). In Gate mode, a Clip will play only while its launch key is held down (or you keep the mouse button held on its launch button). When you release the key, the Clip will stop playing at the next quantisation boundary, or immediately if its Quantisation setting is 'None'. In Toggle mode, triggering a Clip will start it playing back, then triggering it again will stop it. This is a particularly useful mode for performing a real-time arrangement, either live or when recording into the Arrangement. The final mode, Repeat, acts much like Trigger mode, except that if you hold down the launch button or MIDI note the Clip will repeatedly restart at the interval set for its quantisation. So, for example, if you set the clip to 1/4, the first beat of the Clip will loop while hold down the launch trigger, and will then continue to play through the entire Clip after you let go. Clips can be launched using MIDI notes, either from a keyboard or trigger pads, or from computer keystrokes. Most of the Clip launch modes (all but Trigger) make more sense when you take this option. Assigning MIDI keys/pads or computer keys is very straightforward. First, choose Edit MIDI Map, or Edit Key Map from the Options menu. All assignable objects in Live will turn blue (in the case of MIDI mapping), or an odd pinkish colour (in the case of Key mapping). Click on the Clip you wish to assign, then play the MIDI note or press the computer key you wish to map to it. When you've finished assigning Clips to keys, exit the mapping mode by unchecking it in the Options menu. In addition to its other advantages, using a MIDI keyboard or pads to trigger Clips allows you to use the Velocity (Vel) percentage setting in the Launch Settings box. This alters the volume of the loop based on the velocity of the Note On message that triggers it. The bottom half of the Launch Settings box deals with our main topic: Follow Actions. In short, Follow Actions are automated actions that are performed at a set amount of time after a Clip launches. The Follow Action Time and the specific action are unique to each clip, allowing you to set up a complex series of events when triggering one Clip after another. A typical example would be to set the time to the length of the Clip and choose the Follow Action 'Play Next'. When this Clip is triggered, it will play and then automatically launch the next adjacent Clip in the track. An important concept with Follow Actions is Clip Groups. 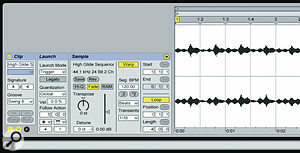 A Clip Group is simply a series of (vertically) adjacent Clips in a track in the Session View. These Clips are all associated as far as Follow Actions are concerned. For example, if you set a group of adjacent Clips to 'Play Next', the Clips will all play in turn, but after the last Clip in the group, play will return to the first Clip, rather than any Clips further down the track. The only two Follow Actions that do not address a group of clips are 'Stop', and 'Play Again', both of which have self-explanatory actions. At first glance, neither of these two actions seem to have a great deal of function, given that having a Clip stop or loop after a certain amount of time can be achieved in more conventional ways. However, they become useful when seen in the context of the random chance element that can be added to Follow Actions, which we'll look at shortly. The other Follow Actions all reference groups of Clips, which is not to say that all the Clips in the group will have the same Action assigned to them. The functions of 'Play Next' and 'Play Previous' shouldn't be too hard to guess, nor 'Play First' and 'Play Last' (the first Clip being the top one in the group of adjacent Clips). 'Play Any' and 'Play Other' are a little more adventurous. 'Play Any' will trigger a random Clip in the group. 'Play Other' triggers a random Clip in the group other than the one that just played. 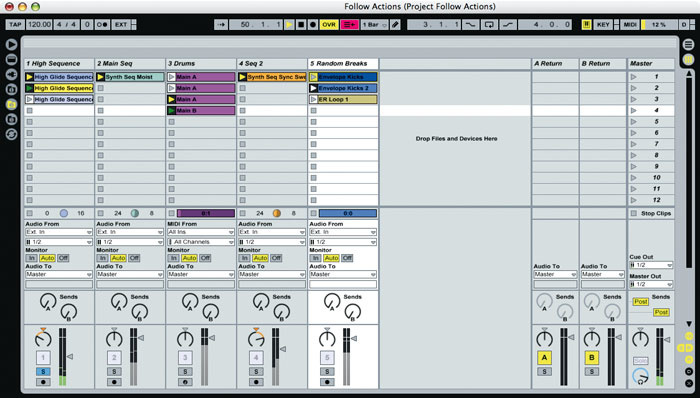 Legato mode can be combined with Follow Actions to generate random breakbeats. Legato mode is one of the coolest Clip launch functions, and combines very effectively with Follow Actions. When a Clip is set to Legato mode (in its Launch Settings box), it launches at the current playback position of the previously playing Clip in the same track. Even if quantisation is set to none, when you launch the Clip it will instantly take over from the previous one exactly in sync with the beat. This is effectively the same as having two Clips playing on different tracks on different crossfader groups and flicking the fader across from one to the other. Legato mode is great when you are triggering Clips from the keyboard or pads, but also works brilliantly if you set up a group of Clips with Follow Actions. In the example in track five of the top screen on page 190 (Clip detail in the screen below), three drum loops in Legato mode are being randomly triggered with Follow Actions every 1/16th note, creating an intricate and varied breakbeat. Used more subtly, the same trick is great when setting up tracks to generate random and occasional variations. This means you can get variations at different points within bars, and with more variety than when just randomly triggering whole Clips. Because Live has to quickly start playback at various places within Clips in Legato mode, it's recommended that you have the Clips loaded into RAM. To do this, simply click the RAM button in each Clip's Sample Settings box. Three of the tracks in this Session use various Follow Actions to add movement and variety to an otherwise repetitive loop.Let's look at an example of Follow Actions at work. 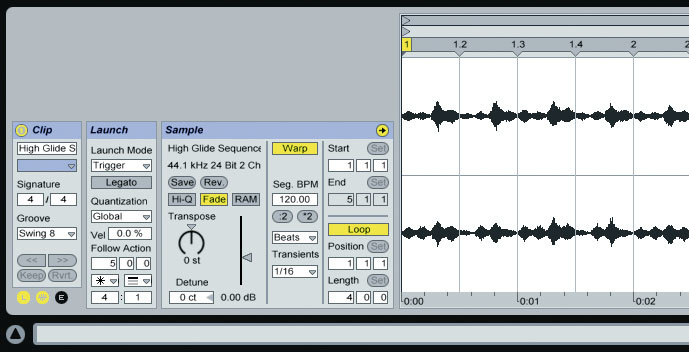 Last month we looked at how to make drum patterns with MIDI Clips for use with Impulse, or other drum machine plug-ins. Now we can chain these Clips together to create longer patterns and arrangement blocks. The screen at the start of this article is a basic one-bar drum pattern. A pretty standard thing to do with a drum machine at this point might be to extend the pattern to four bars and add a variation in the last bar. You could do this by extending the Clip and loop lengths in the MIDI Clip to four bars, then copying and pasting the notes. However, you can use Follow Actions to do this with four one-bar Clips, and leave greater flexibility (because the bar with variation is separate). In the screen to the right I've copied the original Clip three times, so it is in four adjacent slots in the track, and then renamed them so that the last Clip is identified as different. Next I've selected the last Clip and changed some notes to make the variation. The plan now is to chain these four Clips together to form a loop. In the screen, I've selected all the Clips at once, so that I can change all their Follow Actions at the same time. I've then clicked on the Follow Actions pop-up in the Launch Settings, and chosen Next. The Follow Action Time is already set to one bar, so each Clip will play from start to finish, then trigger the next Clip, looping around when it gets to the end of the group. 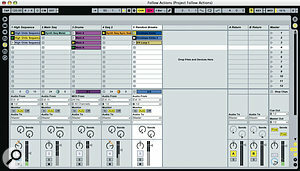 The top screen overleaf shows a session which has three tracks that use Follow Actions. There are very few Clips here, and nothing in the Arrangement, but this song evolves and changes in ways that would have taken ages to program. Track three is the drum track from the previous example. Track one contains three audio Clips that are variations on a synth sequence. All these Clips have a Follow Action of 'Other', with various time factors. This automatically generates a randomly changing pattern of the synth sequence. Track five is the most interesting, as it has three drum loops in Legato mode with the 'Play Any' action, a Follow Action Time of 1/16th, and Legato. This configuration, which generates a constantly changing and non-repeating breakbeat, is explained further in the 'Legato Clip Mode' box on the previous page. Users of the Lite version of Ableton Live — the one that ships with products from the likes of M-Audio, Digidesign, Korg, Line 6, Emu, Focusrite and Novation — can now upgrade to the full version of Live 6 and claim a discount on the sale price. The upgrade unlocks the restrictions of Lite, giving you an unlimited number of tracks, unlimited instances of effects, and higher-resoulution recording rates. Users will also benefit from full Rewire, ASIO and Core Audio capabilities and support for MP3 files. The upgrade costs 379 Euros and is available through www.ableton.com/shop. You may have noticed that there are two pop-up boxes in the Follow Actions section, and a further two numeric fields. This is because you can, in fact, set two separate actions for each Clip, and assign a probability ratio for which action occurs. For example, in the screen below, a Clip's first action slot has been set to 'Any', and the second slot has been set to First. The probability fields have been set to four and one. This means that most plays of the Clip will be followed by a random Clip, but there's one in four chance it will trigger a return to the first Clip. The probability ratio can be set to anything up to 999:1, or any combination in between. Each Clip can be assigned two different Follow Actions and a probability ratio to determine how often each is executed.Follow Actions, and the ability to introduce probability and randomness into their execution, is a feature of a type rarely found in music software: one that has a large and only half-imagined scope, rather than one that performs a specific function or addresses a particular need. Setting up loops spanning multiple Clips and creating random playback sequences are the most obvious applications, and were no doubt the reason Follow Actions was developed, but the inclusion of a larger set of functions, and the random factor, leaves their use open-ended. They are particularly helpful in electronic music, which is all too often repetitive and stale unless painstaking efforts are made to program and arrange variations. These manually created variations are, as often as not, quite randomly arranged. Why not let Live take care of some of the work by placing a few variations to your rhythm and sequence loops into a track and setting up Follow Actions to trigger them from time to time? Taken even further, just a handful of Clips and tracks with various different actions, quantisation settings, follow times, and probability settings can generate an endless and non-repeating musical arrangement that can be used for anything from idea generation to sound art and audio installations.